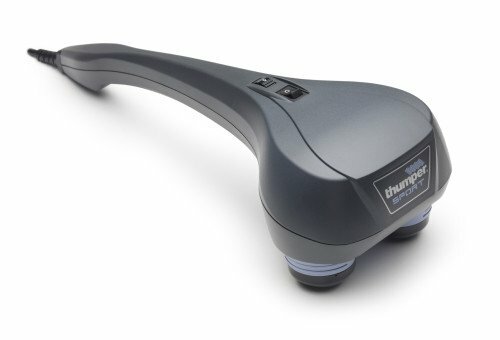 The Thumper® Sport is the massager of choice for home users. If your shoulders are stiff after your initial round of golf at the beginning of the season, if your legs are burning from a bike ride with too much vertical climb, or if you simply spent too much time on your feet at the sales counter, the Thumper® Sport provides all the soothing your muscles need, to make you feel good. The Sport is the Massager with Muscle® for Active Lifestyles. It is a cost effective, high quality massager for home use. Weighing only 3 pounds it’s easy to carry around, and can be used at home, at the gym, or anywhere you travel. Its long ergonomic handle allows you to reach every muscle on your body. No need for oils or lotions. The Thumper Sport works through clothing, providing flexibility for use virtually anywhere. The proven Thumper® drive system delivers a comfortable tapotement action on the muscles, with virtually no kick back to the handle. This makes the massager easy to hold, maneuver and operate. Customize your massage experience through the use of soft or hard massage spheres. Use the variable speed control to select the most comfortable speed setting between 20 and 40 pulses per second. Once you set the speed, the Thumper Sport will maintain it, even if you put additional pressure on the massager. Thumper’s patented drive system ensures strong, smooth percussive movement and long product life. Variable speed control from 20 to 40 pulses per second to suit personal preference. A “True Speed” feedback system that prevents low speed stalls. Interchangeable massage spheres that let you customize your massage experience. Long ergonomic handle makes it easy to reach all muscle groups, shoulders, back, legs.